April is Fair Housing month, and this year HUD launched a campaign that is focused on anti sexual harassment in housing to protect people from experiencing sexual harassment from a landlord, property manager, or maintenance worker. According to a recent study published by the Missouri Law Review, 1 in 10 low income women experienced sexual harassment from their landlords (2). The study interviewed 100 women randomly, and they discovered that the women who had experienced sexual harassment were disproportionately minorities. Although this study had a small sample size, the findings were quite alarming and one could imagine with a larger sample size how much higher the statistics would be. Approximately 16 million women live in public housing across America (2). To protect or to help people who’ve experienced sexual assault, use the Equal Rights Center created an educational booklet about sexual assault in housing, their rights, and who to report incidences to. 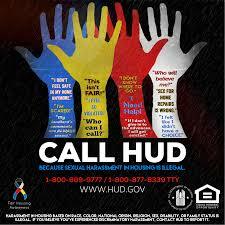 In addition, HUD’s campaign has phone numbers to report such happenings. HUD also has a fact sheet that can be helpful in educating and spreading awareness about sexual harassment as well. Click here to view it. Click here to view the Equal Rights Center’s educational tool kit on Sexual Harassment in Housing and how to report sexual harassment.